Does it count if you had the Custom RV work done for you instead of doing it yourself? If so, then I'd like to share with you guys how we turned our rig into our home. Originally 'my' side of the rig had one of those soft leather Euro chairs with matching foot stool, positioned right next to the window in the slide-out on the driver's side of the coach. We got rid of those and replaced them with a nice cloth covered Lazyboy recliner. Then we had a built-in computer desk constructed out of matching light maple wood to match the interior of the coach. We added a credenza the length of the whole slide-out wall and replaced the free-standing kitchen table with one that pulls out of the credenza to lengthen it when needed. Next we pulled out the couch on the passenger side slide-out and replaced it with another nice cloth covered (but not matching) Lazyboy recliner. We then added my wife's heirloom secretary's roll-top desk to 'her' side of the coach that she uses for her computer table and 'office'. Then we topped it off with a 30"x18" butcher block table on casters. Oh yea, and my wife just reminded me that we also pulled out the combo washer/dryer and had pullout shelves installed as my clothes dresser. 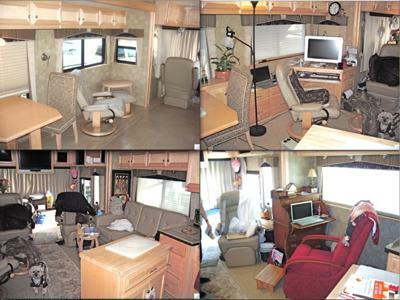 FYI, we had all this work done on our '06 Country Coach by Davis Cabinets in Junction City OR. I guess that's it (for now). Thanks Guys! Exactly the kind of thing I was hopin' to see... Folks adjusting their rigs for what they needed... and having somebody else do the actual work is fine by me... maybe even makes more sense... leaves more time for fishing that way :-) I figure four stars is for doin' it yourself... and five is for those ground up amazing sorts of rigs :-) ... Good Work and Many thanks for sharing! ... Oh Yeah... Thanks for figurin' out how to squeeze more pics in! That's one shortcoming of the 'system'... I think I can get more emailed to me but YOUR solution is SWEET!